Proficient readers need to orchestrate many skills as they read print. While most master spoken language in the first few years of life, written language poses new challenges. There are parallels between speech and writing, and together they make up language, but there are many differences. For example, writing doesn’t include features such as intonation, rhythm, phrasing and pausing. And in parallel, talking doesn’t indicate sentence and paragraphs. Secondly, speech and writing use different contexts for different purposes. So the meanings that we use in written contexts are not always easily translated into talk. Writing and talking also end up being used for different purposes. I could go on to discuss variations that occur that reflect the special and cultural groups to which we belong as speakers and writers (dialects). There are also functional variations that reflect what is going on, who is taking part and the role that language is fulfilling. Written language places new demands on the child as they try to grapple with the fact that language can be represented symbolically. To read and write children need to learn the letters of the alphabet and to understand that they each have names and sounds. But on top of this they need to understand that in varied combinations with each other these letters can represent approximately 45 separate sounds (phonemes). They also need to apply their knowledge of syntax (the grammar of language) in new ways, which while based on that, which they have learned as speakers, is more complex. They need to bring their knowledge of word meanings and knowledge of their world and orchestrate this with everything else as they attempt to decode and recognise words. Code-breakers and recognize and understand the fundamental features’ of written texts, including alphabetic knowledge, sounding out unknown words, spelling, punctuation, page layout, directionality (left to right, top to bottom) when reading and writing, typographical features and why they are used. Text-participants and understand the meaning and structure of language, including the way the text is constructed to make meaning, the literal and figurative meanings of words and expressions. This role requires the reader to draw on their prior knowledge of the world to make sense of the language. Text-users and understand that texts have culturally and socially acceptable uses in specific contexts. This involves understanding what counts as reading in specific situations and knowing how to perform this task. They need to learn how to participate in specific readings, use texts to achieve specific purposes, and interact with others concerning written language. Text-analysts learning that texts are carefully constructed language forms that the authors see as having specific purposes. They are not ideologically neutral. They reflect the author’s particular view of the world. This role requires the child to learn to recognize bias, points of view, writer purpose etc. This might seem much too complex for the young reader, but consider the comment of my five-year-old grandson recently in response to a comment I made about the book Jack and Beanstalk. I commented that Jack had disobeyed his mother but that everything worked out well in the end. My grandson commented, “yes, but only because he stole lots of things from the Giant”. 2. So what about phonics? I have outlined the above so that phonics is seen rightfully as part of what children need to know. If we lose sight of this we might well provide support that has limitations. There are some who see beginning reading as simply teaching children phonics. They seem to assume that if you teach them the sounds and how to decode words they will eventually read. This is simplistic. While children cannot read without decoding there is much more to being a proficient reader. If phonics is viewed as one of the areas of knowledge that readers require and decoding as one of the roles that the reader performs, it will affect the way we help children with phonics. a) Synthetic approaches – involve the systematic teaching of letter-sound correspondence and their combination into words. Even within this approach there are variations. One approach it to begin with single letters and move on to their combination into consonant and vowel words (c-v) before moving on to c-v-c words (e.g. c-a-t). A second approach (which in my teaching days we called the ‘Hay-Wingo’ approach based on the names of the authors of a key reference) involves teaching consonant vowel combinations first which are then blended with a consonant (e.g. ca-t). The synthetic approach has the advantage that you can systematically teach all sounds and then train children to blend them. However, the approach does not accommodate the many inconsistencies in language (e.g. ea can have the long vowel sound for ‘e’ in words like read but the short sound for ‘e’ in words like lead). As well, it encourages readers to rely primarily on letter-sound strategies and draw less on whole word recognition and the use of context to help them work out a word. For example, a beginning reader who has learned most of their single letter names and sounds and is starting to blend them to read simple words like dog, big, hot, top etc., will need to use context if they strike more phonically demanding words such as television, shine, walk, porch. While these words can be decoded, the beginning reader won’t have the decoding knowledge to do so. As well, there will be words that can’t be decoded (e.g. here, the, there). Using context will help them to work out the word, continue reading, understand the sentence and gain confidence. •when a word ends with a silent ‘e’, it makes the preceding vowel say its name. The major limitation of this method is that few rules are absolutely consistent and the use of rules like the above are at best, only helpful for explaining some of the inconsistencies. c) Phonic family approach – this approach is a variation of the synthetic approach and involves teaching specific phonemes, which are then blended with consonants to form words. For example, ‘at’ (c-at, s-at, h-at, p-at etc). Typically teachers when using this approach teach a few consonants and vowels then begin to focus on families before moving on to more difficult phonemes (e.g. ow, au, ph etc). The main difference with this approach is that it offers practice in specific groups of words (word families) not just separate sounds. It is usually a more interesting and enjoyable approach and tends to make beginning readers feel more successful as they apply their phonic families to learn lots of word. d) Analytic approach – this approach focuses on consistencies and inconsistencies within words that are being encountered as part of simple books that they are attempting to read, or being read with an adult as part of a shared reading experience (e.g. big format books). While within this approach children are taught to read some words by sight (i.e. words that are hard to decode such as ‘the’ and which are basically learnt from the shape of the word and their appearance from memory), and some sounds are still taught systematically, sounds are typically taught less systematically as needs are observed. The major weakness of this approach is that it is less systematic and has limitations for less able learners and those with less language proficiency. As well, the use of whole texts can mean that readers rely heavily on context and memorisation to read simple books. Supporters of analytic approaches argue that the reading of whole texts is the purpose of reading and that methods that help beginning readers to utilise decoding in unison with other skills and knowledge is preferable. My preferred approach to phonics is an integrate one. Primarily, I use a combination of synthetic, phonic family and analytic approaches. No this isn’t a mad form of eclectism, it simply recognises the features of each that are helpful. The following sequence is consistent with how I have taught young children how to read as well as older children who have experienced reading problems. Again, it situates phonics within an overall approach to beginning reading. i) Stimulate language – from birth talk to, sing to, read with, question; in short, engage with your child. This should continue through the pre-school years with increasing attention being given to the symbolic representation of meaning and language from the start (e.g. pointing to a picture in a book, a photo, a model etc and saying “Look, that’s a ….”). It goes without saying that you should read to them every day (preferably more than once). ii) Direct attention to symbols (pretty much from birth but certainly by 12 months) – In time (very early on in relation to print in books) you begin to point to words in their world. Words are found in many places when you look, including books, posters, signs, TV, computers, clothing etc. The earliest symbolic representations that your child will recognise will probably be advertising slogans or logos (the big ‘M’ in McDonalds, Weet Bix, STOP etc). iii) Read increasingly varied material (from age 2) – try to introduce a variety of fiction and non-fiction. Perhaps join a local library and go weekly as a special treat. Try some poetry, chants and rhymes as well as songs (that are read as well as sung). As well, begin to read interesting things on screen as you use digital literacy in your life. From about two you could visit children’s websites together (e.g. ABC Kids) and look and enjoy the written language as well as the images and sound. iv) Begin to focus on letters and individual words (from about 2) – As you read together or as you’re out and about doing things together begin to focus some of your child’s attention on letters and words. “This word says Mum”. “B for ball”. “Your name starts with the sound J”. “That says ABC Kids”. “That says OPEN”. And so on. Note, this is all part of daily life, this is not the time for lessons. v) Try to encourage them to read along (from about 2+) – As you read predictable storybooks encourage your child to join in by predicting the next word, or the next phrase. “But where’s the Green sheep?” “Not by the hair of my chiny …..” (child encouraged to complete). At first this is largely verbal, but in time you point to the words on the page and your child will be trying to recognise the symbols as well. Moving from the verbal to the visual takes a long time. Some children begin to get this at about age 3, whereas others won’t get it till they are 5+. Be patient. vi) Begin to write their stories or experiences down (from about 3-4) – and have them show this tom others and perhaps even try to read what it says. The language will be simple. Perhaps your child has drawn a picture of a shark after a trip to a museum. You might simply ask you to tell you what it is and write the words as a label, e.g. “A White Pointer Shark”. Later, you might write down descriptions of events that you’ve shared, with your child dictating the words and you scribing for them. vii) Begin to teach some words, sounds and numbers (from 4) – some children will be trying to do this earlier than four; encourage it if they show interest (older brothers and sisters often motivate them early). At first this is likely to be linked to their name, environmental signs, language on clothing, TV words (children’s television will begin to teach them numbers and sounds) but later you will see countless opportunities to point to symbols at home and when you’re out driving, shopping etc. If your child is in institutional childcare then they will also experience other opportunities as well. This is not to suggest that preschool is better for language acquisition, it isn’t. Nothing is as good as the close attention and love of a parent. However, childcare can be a stimulating learning environment with well-trained and caring childcare workers and teachers. Teach some consonants (e.g. b, t, c, s, g, s, m, f, l) and a few whole words – don’t do ‘b’ and ‘d’ at the same time, virtually every child will reverse them right up to school age (this is normal) so don’t complicate things further. Use the name as well as the sound. “Look, that’s a ‘b’.” “Can you see the ‘r’ in Rebecca?”. While you’re pointing out letters teach a few whole words. For example, their name, mum, dad, kids (as in ABC Kids), STOP etc. Point to letters, numbers and words as you read things and also write them down with them and encourage them to write as well. Introduce the vowels (a, e, I, o, u) – while you can point to the vowels separately these are better introduced as part of words or in combination with consonants. “That says ‘u’ in mum”. “Let’s look for some ‘at’ words on this page”. “Let’s write some ‘at’ words together.” You might even sound out special words in stories. For example, in books that use sound words you should say them and point to them. “Mr McGee is saying OWWWW and OOOOO”. “Look, that says BANG”. Point out other print conventions – as your child begins to learn more about written language he/she will have lots of questions that you should try to answer. As well, you might point out punctuation, the difference between upper and lower case letters. Play games that use words, sounds and numbers – Word BINGO and I Spy are simple examples but there are many commercial examples. Many games can make car trips seem shorter and act as a catalyst for families doing things togethers (including brothers and sisters). •Simple word familles (c-v or v-c) – e.g. in, up, am, us, at, on, it etc. •Simple c-v-c words – e.g. cat, dog, mum, dad, hat, pup, pot, hop etc. •Three letter word families (cvc) – e.g. ing, ong, ant. •Initial consonant digraphs – e.g. sh, th, ck, wh etc. •Initial consonant blends – e.g. tr, dr, gr, cr, st, bl, fr, fl, gl, pl, pr etc. •Final consonant blends (usually with a vowel before it) – e.g. st, mp, nd, nt, nk, ft, ld, lt.
•Simple vowel digraphs and diphthongs – e.g. ee, oo, ay, ar. •Long vowel ‘y’ as in ‘my’ and then later other long vowels. • Three letter initial consonant blends – e.g. str, spr, shr, thr, squ. •Other harder digraphs and diphthongs – e.g. oy, er, oa, ai, or, ar, ou, ow, ea, ur, ay, ir, aw, ie, ui, ph. •Silent letters – e.g. ‘k’ as in knee. •Other complex phonograms – e.g. augh, ough, aught, ought, eight, our. One final comment. Most learning about phonics will occur once children reach school age. The best thing that parents can do is gently teach some sounds and sight words (i.e. whole words recognised from memory). If any sounds are taught remember to use a combination of the three approaches I mentioned above. Teach some sounds and practice blending (e.g. c-v-c), play with phonic familles (write down some at words or just read “The Cat in the Hat”) and point to whole words and sounds as you read with your child as part of everyday life. And remember that the ability to decode is just one of the strategies at the disposal of readers. Cairney, T.H. (1990). 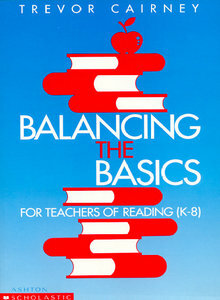 Balancing the basics, 2nd Edition. Scholastic: Sydney. Freebody, P., &Luke, A. (1990) Literacies programs: Debates and demands in cultural context. Prospect: Australian Journal of TESOL, 5(7), 7-16.